Boundary Devices Nitrogen6X was one of the first boards based on Freescale i.MX 6 processor when it launched in 2012, and even I never owned their board personally, I liked the fact the company published frequent updates about software development on their blog. 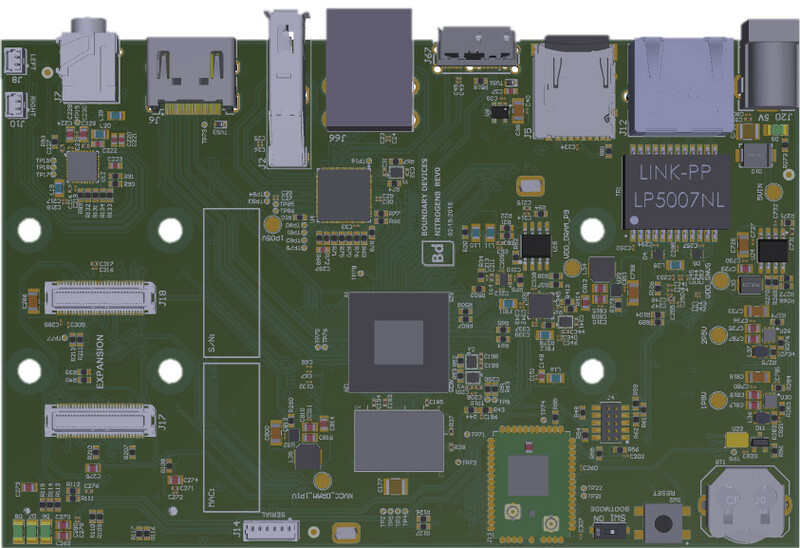 With NXP i.MX 8 processors now officially available, the company introduced an update to their SBC with Nitrogen8X powered by NXP i.MX 8MQ quad core processor, with 2 to 4 GB LPDDR4 RAM, 8 to 128 GB flash, a certified wireless module for WiFi and Bluetooth, and more. The form factor has changed dramatically however. The board supports Android, Linux Yocto, Ubuntu, Buildroot, and QNX. It’s still early so documentation and software have not been released but eventually we should expect more details on the company’s Wiki, and Github account. Audio capabilities, 4K video support, and video interfaces in NXP i.MX 8M processor makes Nitrogen8M especially suitable for streaming video devices (OTT set-top box, digital signage..), streaming audio devices, voice control and voice assistants, as well as General purpose human machine interface (HMI) solutions. But the company is also working on other Nitrogen8 boards and SoMs such as Nitrogen8X based on i.MX 8X processor for industrial and mission critical applications requiring enhanced reliability, and Nitrogen8MAX with the more powerful i.MX 8Max for multi-display/platform applications. Availability and pricing are still unknown, but Nitrogen8M SBC should become available first, with Nitrogen8X and Nitrogen8MAX launched later on.